The Saboteur Twist was first introduced on Season 12 of Big Brother. The premise behind the saboteur twist was to have a house guest in the house that would wreak havoc and annoy the other unknowing house guests. The saboteur would be chosen by either CBS producers or by the viewing public. Some of the havoc and annoying tasks the saboteur would complete would be directed toward a group of house guests, an individual or the entire house. Initially the first saboteur was Annie Whittington, who entered the house at the same time as the others and had the potential to win $50,000, if she successfully completed tasks and avoided eviction for 5 weeks. If the saboteur was evicted before the first five weeks they would not receive the $50,000 prize. The saboteur was still eligible to win HOH & POV competitions. 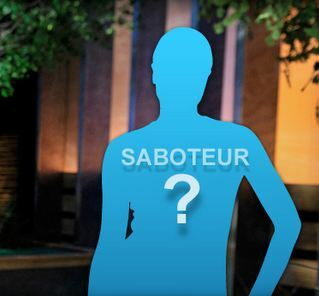 The second saboteur was chosen by the viewing public when CBS producers put up a poll up online to see who the American public wanted to fill the position. Ragan Fox won the poll and was asked during a diary room session if he would accept the roll for a chance to win $20,000 if he successfully completed two weeks of sabotage. At random times during the saboteur’s reign the house guests would be asked to gather in the living room where a message would be played from the saboteur over the television screen. The taped messages would show a silhouette of a person and the voice was also altered to avoid detection. The saboteur’s messages often alerted them to be aware of upcoming sabotage. The first saboteur who had the opportunity to win $50,000 if she successfully made it to week 5, however she was the first house guest evicted from the big brother 12 house. Annie was only able to complete 3 acts of sabotage and therefore did not earn the prize. The reason for her eviction was not due to the other house guests suspecting her to be the saboteur. However, after her eviction the other house guests suspected the saboteur to be her, Brendon or Andrew. Ragan was chosen by the viewing public to be the second saboteur after the eviction of Annie. As the new saboteur Ragan was tasked with completing acts of sabotage over a two week period. At the end of the two weeks Ragan had avoided detection and won the $20,000 prize. During his reign of sabotage the other house guests did not suspect him to be the saboteur.